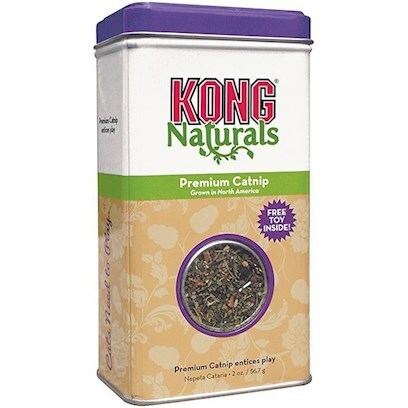 KONG Naturals Premium Catnip is North American grown catnip of the highest quality. KONG catnip is harvested at the peak of its flavor, color and fragrance and field-dried. KONG's premium leaf and flower cut gives you minimal stems and seeds and more of the essential oils that cause a reaction in most cats. Use as a stand-alone treat or in KONG refillable catnip toys. KONG Naturals are ecologically responsible cat products. All ingredients and oils come from natural, renewable resources. These products are designed to appeal to the natural instincts of the indoor cat, providing fun with a purpose.